I had a brow crisis. I lost my pink Mini Slant Tweezerman Tweezers and in this case, I did not have a backup. I for one can’t deal with unruly brows and last week, gone midnight I ventured online & bought another pair - I just couldn’t be without them. The quality of Tweezerman Tweezers is second to none and repurchasing another pair is testament to this. For over 25 years these award-winning tweezers have been the top choice for makeup artists and celebrities and I’m not surprised, these tweezers have been created for precision plucking. So what’s the hype all about? Well, these tweezers are light and sleek, yet sturdy and firmly grip hairs at the base without pinching the skin. The tips are perfectly aligned for accurate and effortless plucking. 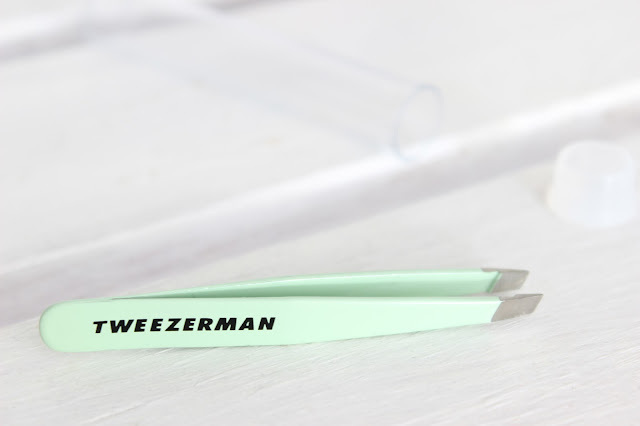 And don’t be fooled ladies, the Tweezerman Mini Slant Tweezer is just a smaller version of it’s full sized sister the original Tweezerman Slant Tweezers and their size do not hinder their ability to get at those pesky teeny tiny hairs, that other tweezers often fail to remove. With a full sized pair setting you back just a little over £20, you’ll be happy to hear that this pair is comparatively affordable at just £12.50 (just try not to lose them!). I purchased mine online from Look Fantastic as they had a discount code available and they don’t charge for delivery. The Tweezerman Mini Slant Tweezer are the ideal size for both travel and your makeup bag. You can choose from several enamel colours, or opt for classic stainless steel. I for one love the Tweezerman Mini Slant Tweezer in Green Tea, clearly I was meant to lose a pair, so I had an excuse to buy this pair instead!